In this week's comics, Grant Morrison puts him imprimatur on The Avengers, but not the ones you expect. 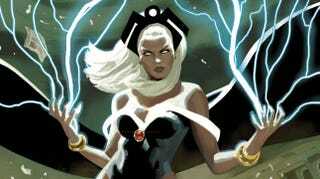 On a similar albeit unrelated note, Brian Michael Bendis is also writing Marvel's Avengers (above), wherein Storm joins the team. Let's see what else is on the shelves Wednesday. First off, Boom is republishing Grant Morrison's 1990s take on John Steed and Emma Peel in the reprinted miniseries Steed and Mrs. Peel. I've never read this before, but I can imagine it's early Morrison doing his highfalutin weirdness thing with 1960s espionage. Could be worth a peek. There's also the debut of Kirby: Genesis - Dragonsbane, a Norse superhero who's part of Dynamite's Kirbyverse. Dynamite is also releasing a new Tarzan series, Lord of the Jungle, and IDW kicks off a new Danger Girl series, Revolver. Finally, Marvel's releasing a new Spartan-friendly Halo comic, Fall Of Reach: Invasion. This week you can anticipate new issues of Scott Snyder's Batman, Brian Azzarello's Wonder Woman (preview here), Fables, Memorial (preview here), Daredevil (which we've really been enjoying), Invincible Iron Man, Uncanny X-Force, and Uncanny X-Men. You can pick up the final volume of Gail Simon's Secret Six (The Darkest House), the first volume of J. Michael Straczynski's old-school superhero series The Twelve, a bookshelf collection of vintage New Defenders stories, and the second omnibus of Chris Claremont and Jim Lee's Uncanny X-Men run. And as usual, here's the list of everything being released to comic stores tomorrow, and you can find your nearest comic retailer here. Happy reading, gang!